You know what I love? When my blog post calendar says "new quilt" and that means I have-to-get-to prepare by starting said new quilt. Yippeee! I don't always keep a blog post calendar, but lately I'm juggling holiday projects as well as working on my book in the background, so it's more peaceful to plan ahead. 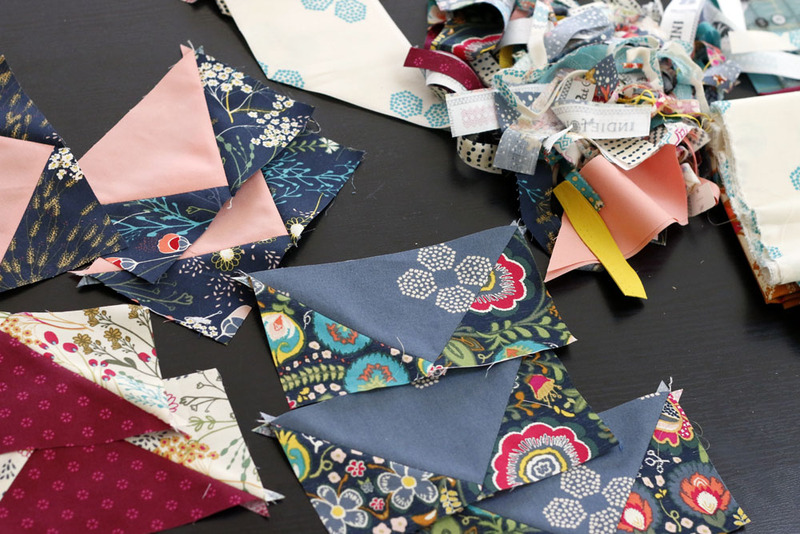 I've been wanting to cut into a new stack of fabrics called Indie Folk by Pat Bravo. I first happened upon this collection via Melanie Traylor's blog. Immediately, I was drawn to the rich fall colors: burgundy, teal, steel gray, midnight and gold. I especially love the darker prints in this collection. They have a lovely Indian flavor that's new to my fabric stash. I decided to go all-in with a quilt made entirely of handpicked fabrics from the collection, plus Art Gallery solids, in part because I'm wondering how it will feel. Art Gallery's quilting cottons are slightly thinner and silkier than Freespirit and Robert Kaufman's, for example. Will the quilt feel more like voile, but in other ways have the benefits of quilting cotton? We shall see. This is the first time I've used Art Gallery solids, branded Pure Elements. I chose some shades suggested to coordinate with the collection on Art Gallery's website. The Empire Yellow is more vivid than I expected, and at first I thought I wouldn't use it. But now I actually love how strongly it pops with these saturated autumnal shades. To get started I made stacks of fabrics I might like to pair together. Then, I began cutting for 3" x 6" flying geese using my Fons & Porter Flying Geese Ruler. This is a favorite ruler of mine because it makes the cutting for flying geese easy and flexible. You can use the same strips for the geese part of the block or the background part of the block. Plus, the notched triangle points that result from using the ruler promote accuracy so that I don't have to trim up blocks before joining. No-trim flying geese, it's a tutorial actually. Before long I had tasted my first few batches of geese. Patchwork is so satisfying! These are some of my favorites. And now I've collected flocks of them. I'm not sure if all the geese will be arranged vertically or if I'll do some horizontally. Hmm.... For sure I'm thinking all geese. I've yet to do an all-geese quilt. I think it's time! Disclosure: Links to rulers or other projects on Amazon here and otherwise are affiliate links. That means I earn a small commission on sales resulting from following these links. Thank you! Also, Indie Folk fabrics were provided by Art Gallery on my request. Holiday Handmades in the shop!